Oil paint color mixing guide for everyone, it simply works! My color mixing guide, how to mix your colors, color recipes, color mixing tips, and a few pointers on setting up your palette. Why is color even important? Did you know that color is the #1 factor in the decision process of an art purchase. Yep! If the color aien't right, the buyer moves on! Read further to find out how to mix your colors, how to match any color using 3 to 5 colors, and to set up your palette for a faster way to accomplish these tasks. Value = refers to the lightness or darkness of a color. Intensity = how bright or dull it is. Hue = Hue is just another word for color. Red hue means red color. Temperature = how close to fire, or ice the color is. It’s a general practice to tint a color with white, thus making it lighter. And shading a color with black to darken it. But this doesn’t work all of the time with oil colors. The Masters usually used a very limited palette. This was due to many factors, cost, time in grinding their own, or having apprentices doing this, and availability of the raw compounds or their own previous training or preferences. 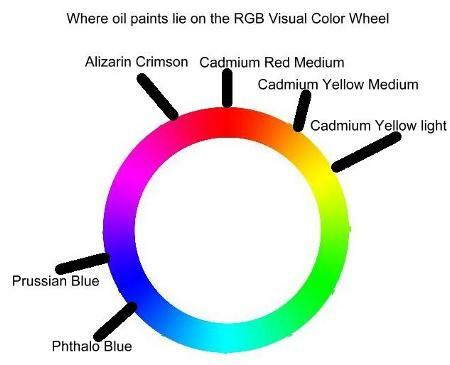 In today’s world, access to different oil colors is mind boggling. So where do you start? Well, if you’ve been following some of my lessons here, and you’ve started a work, you’ll know I begin with an imprimatura, (a coated pre-colored toned canvas) of a yellow ochre/olive. Then the first and second Umber underlayer using burnt umber as the only paint. From here we go into the dead or gray layer which uses a prepared black, white, and 3 to 5 midtones. and 1/8 part Prussian Blue. You can experiment with making a very deep rich black using just Prussian blue and burnt umber. And it will dry faster than when using Ivory Black. and a touch of Prussian Blue. The lightness or darkness is depending on the average tone of the entire painting. I find this by squinting my eyes to get the average tone of the whole subject matter. I've also found a few other things I'd like to pass along to you. I have found Flake White, and Zinc White will not cover (not enough opacity) during the dead layer. They are however, the brightest whites for highlights. I have also found that Permalba is a very good blend of Titanium and Zinc white that does cover well in the dead layer. And not the RGB Visual Color Wheel. (below) You should keep both within your studio, the later being for color schemes and color meaning within your work. 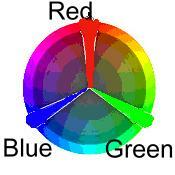 Besides, the color wheel below is geared more for techie's in the television and lighting world. If all of this is a bit to much, and you need a full understanding of color and a super color mixing guide, read my review of Richard Robinsons Color Course! It truly is one of the best color mixing guides and explanations of color mixing recipes out there, and I've been doing this a long time, and Richard taught this old dog lots of tricks! So you ask, Where are your greens? They are completely mixable from the above. A very true and intense green can be created using Phthalo Blue (leans green) and Cadmium Yellow Light (leans green). This green has proven just to intense for my work, and rarely do I see this intense a green in nature, but then again, my eyesight genetically may be different from others and your use of it may be quite satisfactory! I put it out there as something you may want to try. Certainly when you make your color wheel swatch, you will see what to I’m referring. Is this the best palette? Certainly not. It’s only the palette I use. As I said earlier, there are volumes of books on color theory. And this 3 page color mixing guide just scratches the surface of our subject. There are some artist’s that use much less, some that use much more. It depends on your level of mixing capability, the style or art, the color scheme you like to work with. So, how do you mix these colors without getting mud? How do we lighten or darken a particular color? What exercise can I do to help in matching colors I see in my subject matter? Why do I get a green instead of a dark yellow when I mix black with yellow? I thought blue and yellow make green. Click below to get "the rest of the story" or Part II of my color mixing guide. Maybe this is all a bit complicated? Maybe you need a whooooole lot of help? 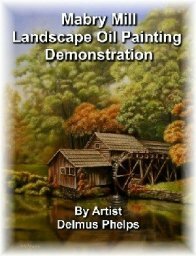 Beginners oil painting guide. Richard has such a great program here. It covers a lot of territory for the beginner! If you haven’t already, please jump over to the color wheel lesson , as it is a precursor to understanding some of the terms and diagrams of what we've talked about here. Ever wonder about why certain colors make ya all mad, or the opposite, a bit romantic maybe. Yep, colors can really have that effect. Have you ever seen a pink public bathroom? No? Would you like to know why? Pink is one of those "lowers your heart rate" and a relaxing color, to the point where I'm gonna sit here all day and read this magazine kinda color. The folks in line outside the door aren't gonna appreciate it either. So, more exciting colors (deep burgundy or reds) or just a drab white will be used, 'cause they don't want you in there all day! Read more about the meaning of color and the psychology of color here. Then you can sit in that pink parlor and ruminate about how to set up your own color palette. NOW, are you ready to get into some more color mixing under your belt? Lets look exactly at what happens when you mix that yellow and black with oil paints. Expecting a dark yellow, sorry, you gonna get a big dollop of green on your palette. Click below to see why. 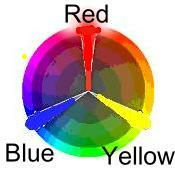 The rest of the story on Color Mixing Guide part 2! This is one of my favorite YouTube videos on color mixing. It is the same basic method I use, and is discussed in great details in Richards Color Course referred to earlier. In the video below, it gives a great idea on how to mix with the help of the chart, or you can also create your own chart. It's only downfall is I've never mixed a color using just two paint colors. Well,... maybe I shouldn't say never. Most colors you are attempting to match will require adjustments in value, and chroma, so.... enjoy the film, it may help give you some ideas. If you're interested in picking up this Magic Palette, then click below to get yours today!